TIDY TOWNS COMMITTEES around the country are asking both sides in the upcoming referendum to keep their towns free of posters. 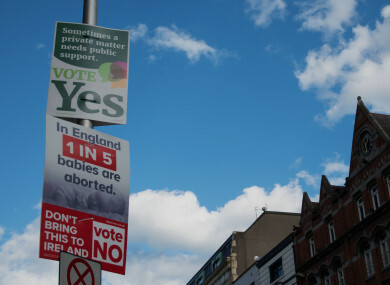 Groups in towns like Cobh, Co Cork and Clondalkin, Co Dublin are asking campaigners not to put up posters in the areas. While the groups cannot legally enforce anything, they often make these requests during general elections or any time when lots of posters are used. Some of the national committees behind campaigns have agreed not to poster certain areas, so if your town is left without one of the sides represented, this might be why. Save the 8th’s spokesman John McGuirk told TheJournal.ie that if a Tidy Towns group makes a request, Save the 8th would “have a discussion to see how we can help”. So far, the group has received “zero” phone calls from Tidy Towns committees, he said, and they often heard of the requests through local media. Save the 8th has agreed not to put up posters in areas that have a long-standing tradition of not having posters, such as Killarney and Westport, he said. But he emphasised the group’s desire to spread its message and the importance of information in a democracy. Together for Yes, which is campaigning for a repeal of the Eighth Amendment, has agreed to comply with the requests that Tidy Towns committees have made. Spokesperson Amy Rose Harte said that the group “acknowledge the requests of other towns who have asked for no postering of any sort in their towns”. In a statement on its website, Love Both said it would work with local communities “should it be feasible to find locations that limit the visual impact within town centres without unreasonably impeding the effect of informing the public on this important referendum matter”. We are concerned that the removal of posters would result in a situation where the public would be deprived of the information they need to make an informed decision on 25 May. Tidy Towns groups across Wicklow are making the ‘no poster’ request, including in Blessington, Avoca, Rathdrum and Wicklow Town. In Wicklow Town, posters from the Love Both campaign have been put up, while Together for Yes and Save the 8th have not put any up. TheJournal.ie contacted Love Both but has not yet heard back from the organisation. The three Together for Yes organisations in Wicklow, which represent the north, south and west of the county that has the sea to its east, have said that they will comply with the requests. They said that that they have requested that the national Together for Yes organisation does not put up posters in this area either. Ian McGahon of North Wicklow Together for Yes told TheJournal.ie that Tidy Town committees in towns like Bray had asked the group not to put up posters in those areas. “We agreed, and we’ve passed that on to the national Together for Yes organisation,” which has agreed to comply with the request, he said. Marian Murphy, who co-ordinates the Save the 8th campaign in Arklow and surrounding areas, said the organisation was “willing to comply” with the request to keep posters out of town centres, but that they had not received requests directly from Tidy Towns committees. As such, she said the group would not take down posters that have already gone up in these areas, as the requests are not legally binding. TheJournal.ie has not yet heard back from the organisation about its Wicklow posters, but the statement on its website says that the group takes its “obligations under the law very seriously and strenuously adhere to the regulations regarding referendum posters”. It committed to taking down posters immediately after the referendum. Andrew Lawless, chairman of Wicklow Tidy Towns, said that the group will “keep pushing” Love Both to change its mind and take the posters in Wicklow Town down. If everyone does it, it’ll be fair to everyone. The organisation is against all temporary posters, he said, both because they harm the image of Wicklow Town and also have potential to harm the environment. This kind of poster, which is made of plastic and also used for general elections and events like circuses, are “of no use to anyone once they’re taken down”, he said. The plastic ties could also end up in the sea. We generate a large amount of plastic waste no matter who is putting the posters up. We don’t want to take any sides. We just want everyone to cooperate. There is no national Tidy Towns organisation and each committee is run at a national level, so there is no coordinated campaign or central list of groups that are calling for their towns to be poster free. Email “Tidy Towns groups across the country are asking campaigners not to put up posters”. Feedback on “Tidy Towns groups across the country are asking campaigners not to put up posters”.